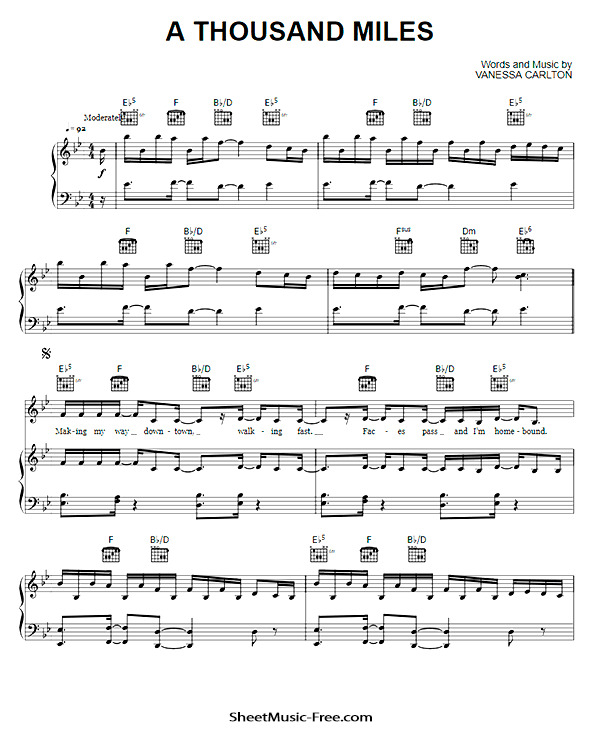 “A Thousand Miles Sheet Music” by Vanessa Carlton, “ A Thousand Miles Sheet Music” for Piano / Vocal/ Guitar Chords , Original key: B Major, number of pages sheet music PDF: 8, Video and Lyrics song A Thousand Miles Sheet Music. “A Thousand Miles’” (originally titled “Interlude“) is the debut single written and recorded by American pop singer Vanessa Carlton. Produced by Curtis Schweitzer and Ron Fair, the song was released as the lead singlefor Carlton’s album Be Not Nobody (2002). Instrument: Piano Sheet Music / Chords / vocal / Guitar Chords. A Thousand Miles Sheet Music Vanessa Carlton.